This is the 22nd of my “Advent Calendar” Christmas ornament posts. For some background information about this project and why I’m challenging myself to complete it, see here. This week, I got a brand new ornament for my tree. My friend Natasha, who sent it, also contributed a great guest post for my blog, explaining why she bought it for me. When she saw it, she was reminded of me, and of microbiology, and thought it would be a nice way to connect us across a distance. I am very touched by the gesture. Not that Natasha chose badly, of course. I love it for what it is and what it represents. 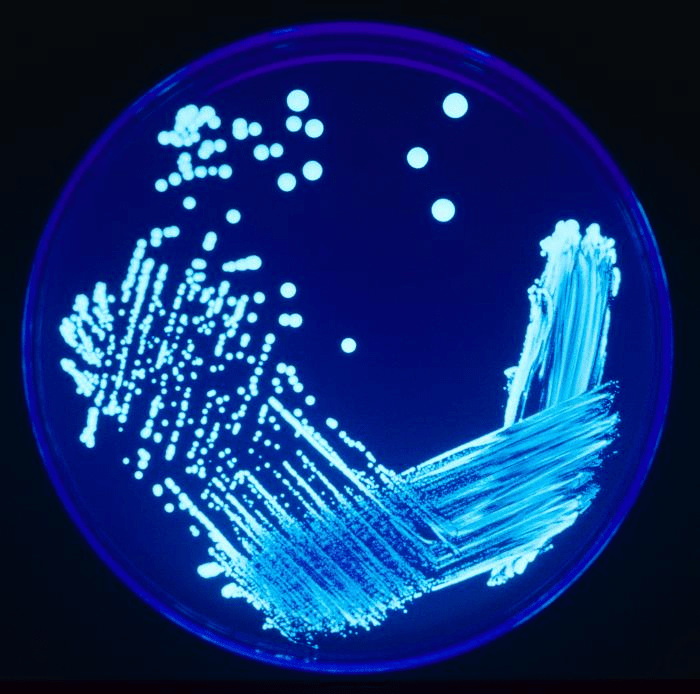 But the pattern on the petri dish, as pretty as it is, would likely flunk the artist right out of med tech school. Microbiology is different from some of the other laboratory sciences, because it’s about identification more than about quantitation. When you get a blood test done, you’re getting a count of types of cells, or a measurement of the concentration of cholesterol or iron you’ve got in your body. With microbiology, it’s a murder mystery, a whodunit. The aim of the game is to label the bug that’s giving you trouble, so the doctor can deal with it properly. I’ll get into the details in a later post (I promise) but you should know that when bacteria are put onto tasty food like what’s in a petri dish, they grow like crazy. Each individual cell stays where it lands and divides like mad, making a little spot. When you have a ton of bacteria, the spots smush together into a smear of goo. To identify the bug, we need a pure colony. Which means a spot that was made by one original bug, isolated from all the rest. We need to spread out the specimen so thin that we’re planting single bugs at a time. That’s not easy. We use a technique of “streaking” across the quadrants of the plate. The idea is to smear a little bit of specimen on the plate, then use a new, sterilized tool to drag a tiny amount of it over to the next quadrant. By the end, you’re dragging thinner and thinner concentrations of bacteria across the plate, and you’ll get isolated colonies that you can then run tests on. 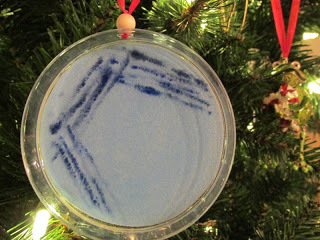 So, while the ornament gets the gist of it, I suspect it was created by an artist who was inspired by the amazing beauty of microbiology, rather than a microbiologist who was moved to create art. Watercolor isn’t the best way to go if you’re trying to recreate the streaking pattern. A thicker paint, dragged across the page like you’d do with the bacteria, might work. But that doesn’t mean I love it any less. This entry was posted in Life and Family, Thoughts & Opinions, Uncategorized and tagged Christmas, holidays, ornament challenge on December 22, 2012 by antijen. This was so interesting! I love hearing about the details of other people’s professions (I’m an accountant…). I think that’s why I like reality shows – it’s fun seeing exactly how make-up artists or fashion designers or really any non-accountants practice their craft.